DuckTales Season 2 Episode 7 Review: What Ever Happened To Della Duck?! Ebenezer Scrooge: I hate life! Ghost of Christmas Present: Nonsense, man! Why? Ebenezer Scrooge: Because life hates me, that's why! Ghost of Christmas Present: Scrooge, you're an even bigger fool than I took you for! Q: How does this version of "A Christmas Carol" differ from the original novel? 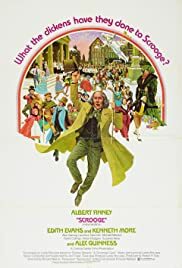 In this delightful musical adaptation of The Charles Dickens' classic, Albert Finney is cast as Ebenezer in `Scrooge,' directed by Ronald Neame, who successfully manages to put a fresh face on the familiar tale. Original music and songs (by Leslie Bricusse), from the jaunty to the poignant, add to this uplifting and appealing version, skillfully crafted and delivered by Neame, and beautifully acted by one and all. At 7:00 on Christmas Eve, Scrooge finally tears himself away from his counting house and makes his way home, commenting along the way (in song) that `I Hate People,' only to be greeted at his front door by the apparition of his late partner, Jacob Marley (Alec Guinness). And of course for Scrooge, it's only the beginning of a night that will change his life forever. First, the visit from Marley's ghost, followed, in succession, by the spirits of Christmas Past (Edith Evans), Christmas Present (Kenneth Moore) and Christmas Yet To Come (Paddy Stone). Though not, perhaps, the definitive portrayal of Scrooge, Finney is outstanding and does lend some distinction to the character of the curmudgeonly miser, from the stoop-shouldered walk he affects to his twisted mouth. But, more importantly, he gets beyond the mere physical aspects to capture the personality and singular perspectives of the man as well, and in doing so makes his Scrooge unique; no small accomplishment considering how many times on stage and screen this character has been done, and by how many different actors. Also turning in notable performances are Edith Evans, who makes her spirit of the past warm and accessibly intimate, and Kenneth Moore, whose spirit of the present is as big and engaging as the life he represents. But the real highlight of the film is the portrayal of Marley's ghost by Alec Guinness. What a magnificent actor, and what a magnificent performance! When Marley first enters Scrooge's room he fairly glides, disjointedly across the room, encumbered by the chains he forged in life and which he now must carry around for eternity. There is a fluid rhythm to his every movement, to every step he takes, that lends a sense of the ethereal to him, without-- it must be noted-- the help of any special effects whatsoever. With nuance and precision, with care given to every minute detail, Guinness truly makes him an otherworldly presence. There has never before been, nor will there ever be in the future, an interpretation of Marley any better than this. It IS the definitive portrayal, and a tribute to talents and abilities of one of the great actors of all time. In addition to the music and songs, there are a couple of scenes that consign this presentation of `A Christmas Carol' the stamp of uniqueness. The first involves the visit from Marley's ghost, wherein Scrooge is taken in flight by Marley, and once aloft they encounter lost souls and phantoms, doomed to wander aimlessly for all eternity. The second is courtesy of the Ghost of the Future, who gives Scrooge a glimpse of the nether world, where he is greeted by Marley, who shows him to the `office' he will occupy for eternity, as well as the massive chain Scrooge has forged for himself during his lifetime. The supporting cast includes Anton Rodgers (Tom Jenkins), who delivers one of the most memorable songs, `Thank you very much;' Mary Peach (Fred's wife), Kay Walsh (Mrs. Fezziwig), Laurence Naismith (Mr. Fezziwig), David Collings (Bob Cratchit), Frances Cuka (Mrs. Cratchit), Richard Beaumont (Tiny Tim) and Suzanne Neve (Isabel). Heartwarming and thoroughly entertaining, `Scrooge' is a welcome addition to the annual holiday festivities. It's always fun to see a new spin on a familiar story, especially when it's as well crafted as this; moreover, this one will leave you whistling a tune and humming for the rest of the day, maybe even for the rest of the year. And that's a deal that's just too hard to pass up. I rate this one 9/10.